I would distinguish between computer music and computer application for music. 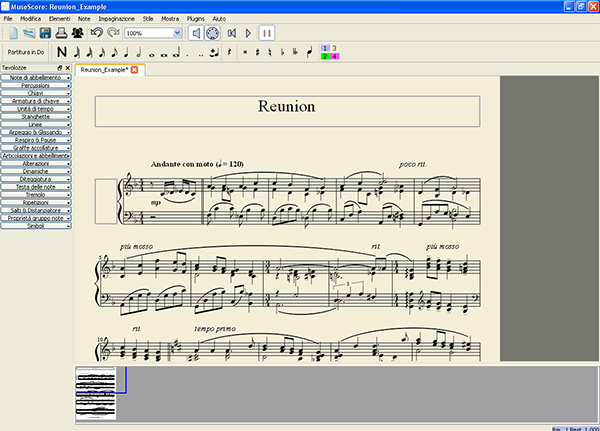 The first suggests music composed through the computer, while the second implies the use of computer for different goals such as analysis, editing or, as in this case, to write musical scores. The latter is possible with notation software like Finale and Sibelius, but they aren’t very cheap. Clearly, they aren’t the only ones. 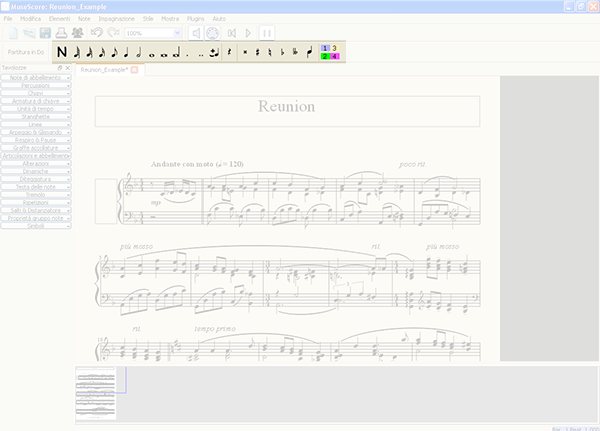 Some people don’t know there is a notation software sophisticated, professional and complete like Finale and Sibelius but totally free: MuseScore, an open source available for Linux, Mac and Windows; useful to write and copy sheet music, to be saved as pdf or audio file. The most sensational thing, isn’t his free availability but its ease of use. First you should download and installing MuseScore, selecting your operating system here. 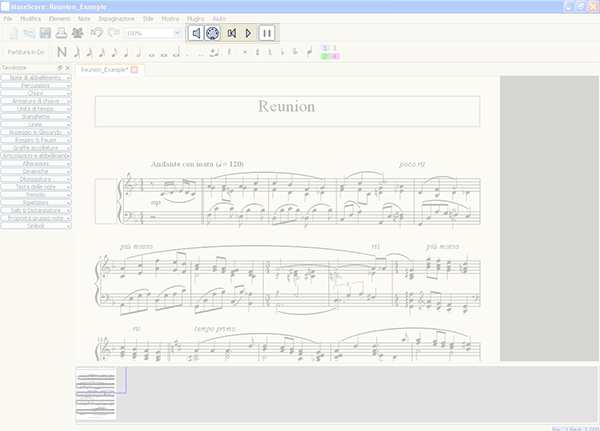 The initial screen of MuseScore, with a single score of example. 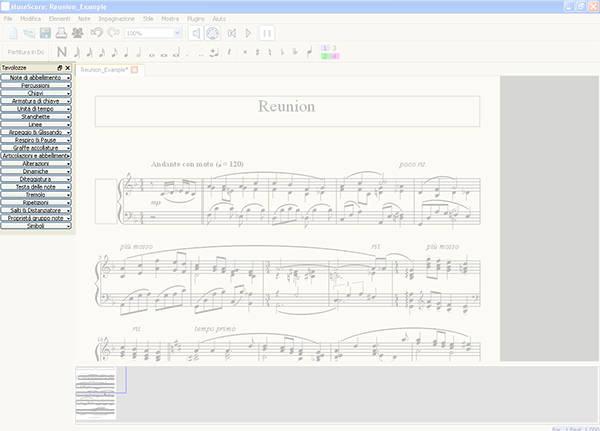 Running MuseScore you can see one score of example, but you can create a new document in the FILE menu. Now you have to select some features as measures, clef, tonality and time; each later editable also. The picture shows the commands group for notes insert. Clicking on a sort of N, you activate insert mode. To insert a note, or an alteration, you have to do some little steps. First, click the duration, or the alteration you prefer. Then, move your mouse on five-line staff and select the pitch. MuseScore automatically calculates the time remaining, changing the breaks length. On the left a list of voice with many symbols of the common music notation. On the left you can see another interesting area. A list of voice which contains many musical symbols, used in the common music notation, such as scales, pitch, key and so on. Every voice contains many symbols, and you can use each simply dragging them on your work area. Very simple. The little commands group allow you to play your score or insert notes through your external MIDI keyboard. We have to do with a little commands group: the first allow you to enable/disable sounds. Yes, every time you insert a note, you can listen the corresponding sound. The second enable/disable the external MIDI insert mode. The last commands give us the possibility to control the sonic reproduction. While the last enable/disable the loop symbols. Clearly I’ve mentioned only to the most important features, but MuseScore have many interesting commands. To write professionally your musical scores. It’s interesting, for example, to consider the save command. You can save your documents in many formats, such as pdf for high resolution print, or the png format for a rapid web publication. But not only. In fact MuseScore allows to export you score as an audio format like wave/flac/ogg, to be listen or editing with your personal audio editor. MuseScore is supported by a large community (developers, and users) which contribute to the refinement of this project. So, I think it is very important start with a site tour. This is the link to the official site. If you are a beginner, please see the manual – in many languages – where you can find any answer to all your questions, to encoding correctly your musical thoughts. I hope.